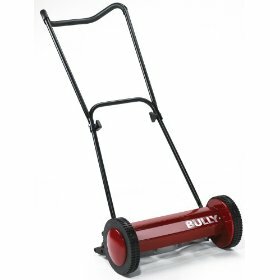 Due to the rising gas prices and the fact that our yards, both front and back, are relatively small, it seemed a bit pointless to keep running the ancient old gas mower we had. It needed a screwdriver to start, was a hand me down anyway, and the fact is, powered motors spinning sharp blades has always deterred me from mowing laws. They just make me nervous. So in a bid to do something for the environment, save space in the shed, and use a mower that i felt comfortable with, we ditched the powered mower for a push reel mower. Our fathers, who had used such things in their adolescent days, of course said we were crazy. They bemoaned the days of using an unpowered mower and the difficulties it caused. However, thus far I have found it to be a worthy investment. There is a bit more time involved in going through the yards to make sure all of the branches and twigs have been picked up lest the mower get snagged on something. However, we have already seen the savings in gas prices, and with small yards, it really isn't that much different. Only now, I don't get nervous about a motor spinning blades near my feet, over which I have no quick control. I do have to be careful when backing the mower up, of course. But all in all, I've been very pleased.